The Homelend ICO is a global peer-to-peer blockchain-based platform for mortgage loan and investments. 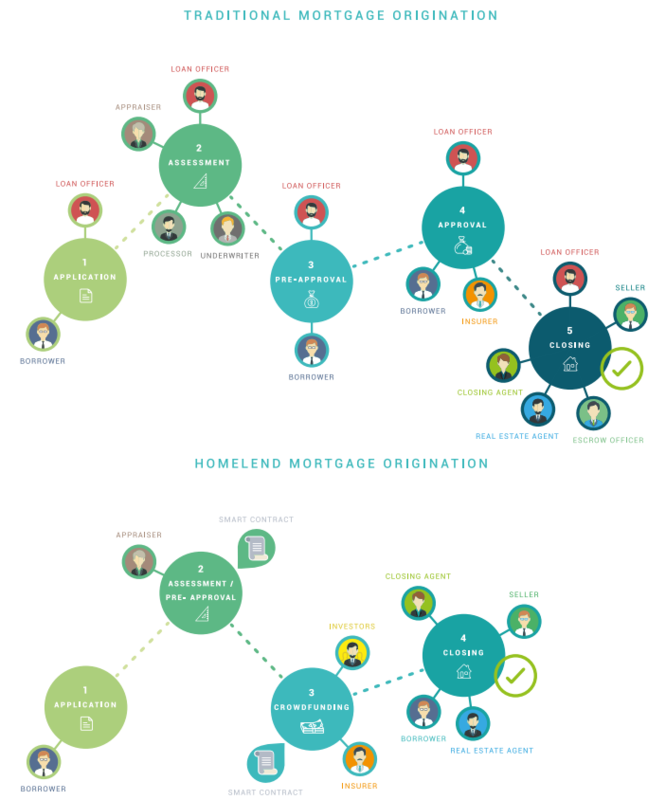 By establishing a decentralized network, they hope to create an infrastructure that will ease the mortgage application and approval process, while establishing better KYC policies for analyzing and approving loan applicants. In this way they hope to restructure the mortgage loan industry. Owning housing is unaffordable for most people, especially if they would prefer to make cash payments. Mortgage interest rates are tax-deductible in some locales, but the option to take out a mortgage may not be possible for some. There is a great deal of time-wasting bureaucracy involved in the loan application process, which is compounded the fact that it cannot be done online. Banks often sell mortgages to third parties, therefore making it difficult to discuss and renegotiate terms with their mortgage holders. Potential buyers with low credit scores are often forced to agree to take out mortgages with high, long-term interest rates (sub-prime loans). This increase the likelihood of their defaulting on the re-payments due to unaffordability, especially when the load issuers fail to do proper due diligence before approving requests. Many sub-primers often purchase properties for speculative reasons in the hopes of reselling their property later of when they have improved their credit scores, in order to take out a mortgage on another property on improved terms. However, these strategies failed in the United States leading economic collapse in 2008. The creation of mortgage securities has further exacerbated the bureaucracy and inefficiency of applying for mortgages and negotiating mortgage terms. Blockchain technology allows for all data to be stored and contracts secured by means of smart contracts, which are encrypted and distributed across a network of nodes when finalized. As this data is very difficult to alter, these smart contracts allow for the simplification of data sharing, access and authentication, as well as for the traceability and transparency of transactions. The Homelend ICO’s platform will also allow for the automatic verification and reliability of all parties by all parties involved in the mortgage process. One aspect of this includes the platform’s AI technology connecting with accredited information providers and assessing the collected data to establish the applicant’s credit risk. This will allow potential lenders to be provided with accurate credit information and general profile of the mortgage applicant so that the lender will have an accurate assessment of the potential risks and profits involved in investing their money in a given mortgage loan. This will improve the probability of the borrower being able to return the investment capital, should the mortgage be forfeited. All information will be encrypted and issued only upon approval by the data-owner. The smart contracts will underwrite the loan, by recording and distributing all data relating to monetary flows between platform users, thereby ensuring that the transactions are securely stored. In this way, new investors and individuals to enter the mortgage loan investment industry with decreased risk. Mortgage applicants will easily be able to confirm the current progress of their mortgage application. Property value assessments cannot be conducted autonomously and will require the involvement of professional property assessment agents. The reduced overall number of intermediaries will lower overall fees. All aspects of the process can be conducted online, thereby eliminating the need for hardcopy documentation. This would save the time involved in submitting documentation, as well as substantially decrease processing fees. Lenders will have free access to the platform. Once the borrower is approved and the property is evaluated, the borrower will be expected to pay the gas cost for completing the origination process. The mortgage amount will be tokenized with each token representing a certain percentage of the property’s fiat value and reflecting the risk evaluation of the original application. This is referred to as creating ‘property slices’ in the whitepaper. This will allow for lenders to invest in a percentage of the loan, rather than having to provide the entire loan amount. Likewise, each lender will receive payments and interest dividends based on there share of the overall mortgage amount invested. Lenders with more capital to invest can select to invest in multiple shares of the same loan, or to diversify their investment portfolios by investing in small percentages of a number of properties. There will be a vesting period of up to thirty days for a mortgage request to be fulfilled, or the collected funds will automatically be returned to each investor. However, while all property shares will be listed in fiat currencies, the platform users will need to transfer the equivalent amount in fiat currencies, in order that all transactions can be accurately stored and traced via smart contract. The use of cryptocurrencies also accounts for the short window period for potential investment, as cryptocurrencies are known for their high volatility rates. Auctioning, which will entail lenders offering borrowers either better interest or mortgage point terms than those offered by the previous bidder. If the capital is raised within the set time-frame, the smart-contracts will automatically transfer the funds to the property’s seller. The seller can choose whether they would prefer to receive the cryptocurrency payments, or whether the platform should liquidate the cryptocurrency to fiat on their behalf. The methodology of this approach will differ based on the legal specifications of each locale. The Homelend platform plans on outsourcing this service initially but hopes to create a protocol for automatically finalizing these legal processes. All transaction fees and on-platform services and products must be paid in HMD. Mortgage points paid out at the conclusion of all payments to the lender must be paid to Homelend in HMD to the value of 1% of the mortgage value.